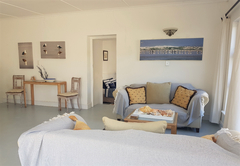 Palm and Pebbles is a highly recommended property providing self catering in Paternoster for tourists visiting the Cape West Coast region. 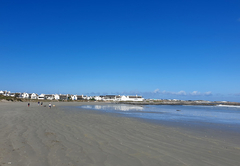 Situated in the heart of Paternoster, Palm and Pebbles offers comfort, friendly, local hospitality and service. It is the perfect place to relax and escape from city life. 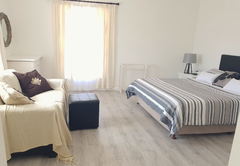 Situated just 200m from the beach and within walking distance of a number of amenities, Palm and Pebbles is perfect for couples or families looking for a home away from home. 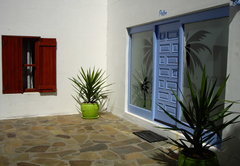 Our self catering cottages, Palm and Pebbles, are comfortably furnished. 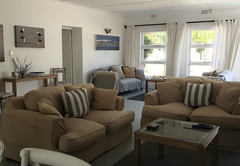 Each cottage is self contained with an open plan lounge, dining room and kitchen. The living space opens out onto a patio with braai facilities. The cottage sleeps six in three bedrooms. 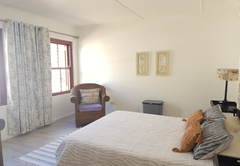 The main bedroom has an en-suite bathroom and the second bathroom is shared. 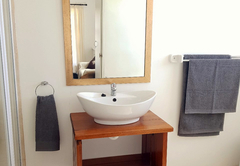 The cottage has two double bedrooms, both with an en-suite bathroom. Enjoy walks on our beach collecting shells and meeting locals. Go cycling or arrange to go horse riding. Take day trips to St Helena, Stompneus Bay, Velddrift, Saldanha and Langebaan or simply stay local and enjoy some of our restaurants. 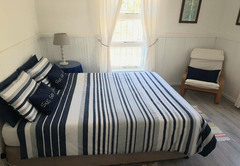 Comfortably sleeps 6 in 3 bedrooms; the main bedroom with an en-suite and second bath shared. 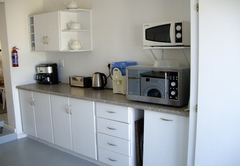 There is a large open plan area consisting of a lounge, dining area and kitchen. 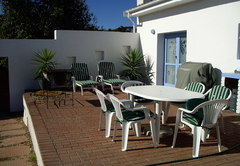 An outside patio with a braai area. 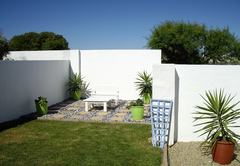 Consists of 2 double bedrooms, both en-suite and sleeps 4. An open plan lounge, dining room and kitchen with an outside braai patio. 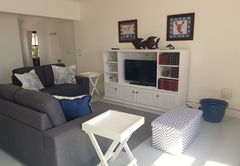 Fantastic very spacious,clean and tidy,very close to beach. Wonderful hosts who go out of their way to make you comfortable. Response timePalm and Pebbles typically responds to requests in 5-10 minutes.